The Scorpion Ball Sweeper is designed to make it easier and faster to move balls off of the practice green. Compare it to your present ball pusher. The Scorpion will replace the awkward tools that most golf courses currently use. The unique patented design of the Roller Assembly along with the Rotating Handle makes it possible to clear off 60 or more balls in one pass in seconds, with very little effort. The Scorpion is designed to maneuver easily with two fingers, not two hands. The Ball Sweeper has the same action as a home carpet sweeper. The handle moves up down with very little effort and the arms stay level to the turf, allowing you to push the sweeper at any angle. You can be 5’ or 7’ tall, and makes no difference, which is why women love it. All exposed handles, arms, and push bar are encased in hunter green vinyl. This not only keeps the sun from deteriorating the plastic, but also eliminates paint scratches and chips. 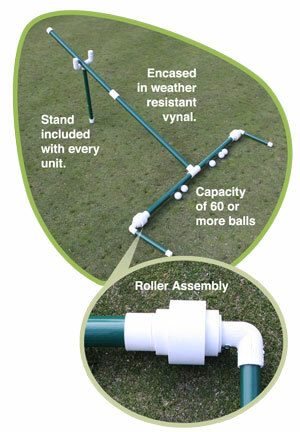 Each unit comes with a stand, so no bending down to pick it up every time you need to use it. Unit is shipped in 4”x4”x48” golf club box and is easy to assemble in minutes with self tapping screws that are included. PVC glue is recommended in addition to the screws. Cost of the Scorpion Ball Sweeper including the stand is $98.00 plus shipping and handling.